Teams consist of up to 24 people, including up to 20 paddlers, one drummer, and up to 3 alternates. You must have at least 8 female paddlers. The minimum number of team participants allowed to race is 16 paddlers and a drummer. All participants must be at least 14 years of age. Full details are included in the official rules. You have until your first practice to confirm your team roster. Each person you recruit for your team will be grateful you did, because they’re going to have a great time! Each team is provided up to 2 practices. One practice is mandatory. The “practice information” section has full details on how to schedule practice(s) for your team. A big part of the dragon boat fun is being creative with your team’s look, name, space in the Team Village, etc. Each team is expected to participate in the parade and opening ceremonies on Friday evening. You’ll want to make sure your team is looking good! Team shirts, banners, flags, and any other creative ideas you may have to set your team apart are encouraged! The practices are an important part of building your team unity, confidence and success! Your coach/steerperson provided by the festival for your practice will teach you all about how to be competitive and have fun. Make sure each of your team members arrive early and have signed and returned a waiver to you. You will need to provide the festival registration personnel, who will be onsite for each practice, a signed waiver for each team member and a completed roster before your team can practice. Forms are available online in the “resources” section if you wish to complete them in advance, or can be picked up from the registration staff prior to your practice and completed at that time. We are encouraging each team to take part in the team village. Each team is provided a space to set up and call home during the festival. No one will be allowed to stay over night in your space. Before your team can compete, you need to stop by the registration tent. Registration staff will confirm that your team has turned in the the required participant waivers and final roster. At that time you will be given one wrist band for each registered team member. Each member of your team will be required to have their wrist bands on before they will be allowed to race. Each team will be expected to participate in our fun and festive opening ceremonies. 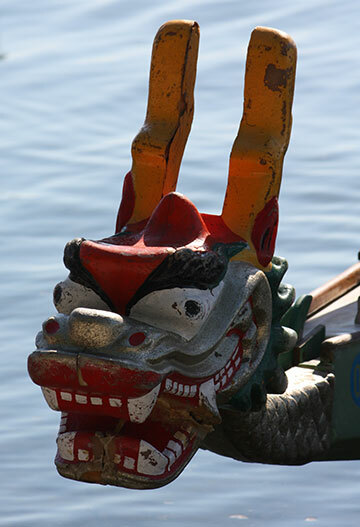 Dragon boat races are rich in Chinese heritage. We will be starting with an opening parade of teams, drum crew and other traditional elements. A complete race schedule will be posted to this site in advance, so you’ll know your estimated racing starting times. Each team will be expected to monitor the progression of the races so that you can be in the team staging/loading area 45 minutes before the start of your races. There will be a Team Manager’s meeting on Saturday. Race officials will provide you with important race information and last minute details. Each team manager should plan on attending. Each team will have two races plus any finals your team qualify for. When your team is between races, there will be plenty for everyone to do. Children’s activities, great food, music and other entertainment will fill the day. Following the conclusion of the dragon boat races, an awards ceremony will be held after the races. You and your entire team will want to be present as awards are given out for top finishers in the races as well as several awards for the best team name, best team village site and more. Gold, Silver and Bronze metals will be awarded along with the grand prize 1st place Trophy. If you have any additional questions, please fell free to contact us.